We are on a roll. Brochure for I am Dutch: check! Equestrian marketing and events agency Equine MERC has already completed many beautiful projects. Recently, these horse people with marketing skills designed a new brochure, this time for the cluster I am Dutch! Five companies specialized in the equestrian marked have joined forces and set up the cluster I am Dutch. The cooperating companies are: Dominick, Equitrend Geert en Henk Trading, Giant and Heritage. By working together, these companies share and utilize not only their expertise in engineering, innovation, efficient production and quality control, but also offer an immense combined experience in both local and international trade, logistics and communication. 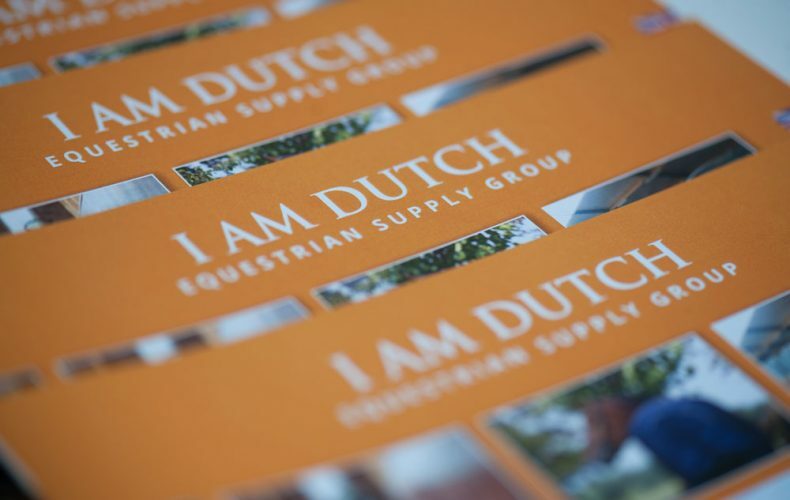 The ambitious heads of these five companies contacted marketing and events agency Equine MERC to create a matching brochure for their cluster I am Dutch. The brochure is bilingual: German and English. Click here to view their brochure! Interested in print specially designed for you by the marketing experts of Equine MERC? Feel free to contact us by email or phone!